What are you doing for Sinterklaas and Christmas this year? A common question in Dutch speaking countries. Not only among family members and neighbors, but also among the entrepreneurs. The holidays are coming. Don’t be late! Is your Belgian and Dutch campaign for Sinterklaas and Christmas ready? Campaign ready for Saint-Nicholas and Christmas? Many entrepreneurs think a communications strategy is too much work, but once you go communications strategy you never go back. The upcoming holidays offer a great opportunity to draw up a small, limited communications strategy. A nice case to find out, what it can do for your business communications in general. Only after you have answered all these questions can you get started. You have defined your boundaries. The boundaries are important. Not only financialy. Boundaries make you less flexible, but they offer more clearity and help you to stay in control. Strategies should be designed with the brain, not with the heart. Green hills instead if white hills. 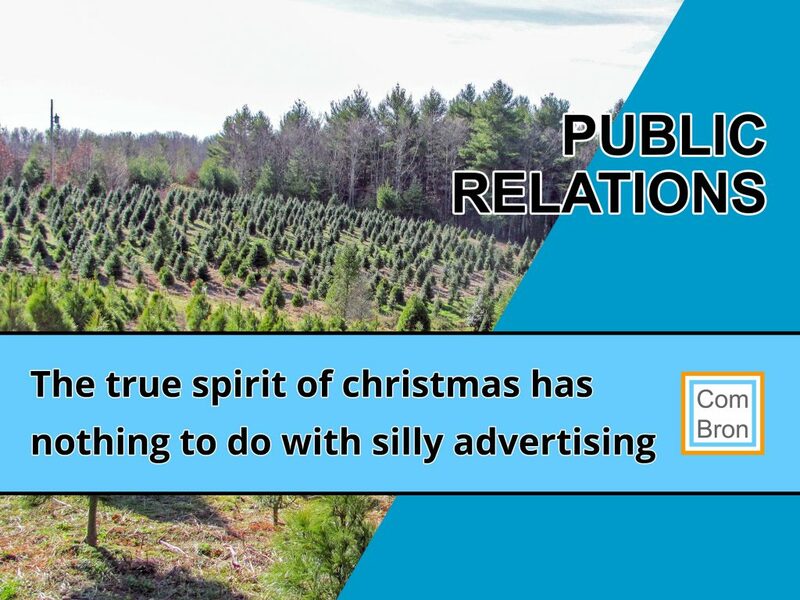 Imagine you have a great idea for a Christmas sales promotion. A product in the webshop you want to build your Christmas campaign around. Do you have clear who you want to reach? Only regular customers, or can you even seduce prospects to become a new group of customers? What did you have to offer them? Why is your product and your offer better? Is your sales promotion purely to push sales or do you pursue another goal (binding, renewal of contacts)? Which channels are used? How do you let your customers and prospects know you have this great promotion? What is the cost of reaching customers? Why spending money on advertising if you cannot measure the return? We do not have a dashboard mentality at ComBron, but advertising by habit is not smart. It is not true that only the bakery (third loaf for free) or the garage (free windshield wipers if we prepare your car for the winter) can measure with a coupon. Be creative! Find something that can be measured, or else advertising makes no sense. If you cannot find a way to measure, you are simply not using the right medium. A commercial on the radio, an ad on the digital signage (narrowcasting channel) in the gym or a home made flyer all have their specific pros and cons. They can all help you reach your goals, if the Return On Investment (ROI) is measurable. Doing nothing may be your best choice. Newspapers and advertising agencies probably tell you otherwise. Why bother if it fits your your business to do nothing? Just as long as it won’t cost you. The biggest target group in Belgium as well as in The Netherlands celebrate Christmas. It also is less complicated then Sinterklaas. As long as you shred your Christmas tree after Christmas (instead burning like the Dutch did in the old days), no one will protest. Given the negativity surrounding Sinterklaas, it is expected that the Christmas season will dilute in the coming years, but it is not yet appreciated to fully deploy it before the end of the Sinterklaas period. Companies and organizations that have something to do with children and / or families cannot ignore the Saint. What you do as a business with the color of Black Pete is still a hot item. ComBron sponsored the local sinterklaas association for years. Our condition was that Pete remained black. It brought us new customers, but it could have cost us just as well. In this case you never do it right. It is a very big issue. Stay away from it if you can. Photo on top of the page by Beni Rupp. Photo of the green hill in the middle of the page Ed Kennedy.